If you somehow didn’t notice it, Lowyat.NET is certainly in a green mode today. 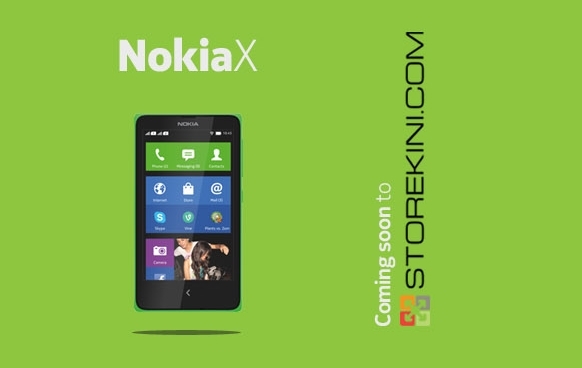 The reason is rather simple: Nokia X will be launched in Malaysia tomorrow and we are able to inform you that consumers are able to order the new device from our own online store, Storekini.com real soon. Officially revealed at Mobile World Congress in Barcelona just barely a week ago, Nokia X is the first model in the family to be made available in our market. Running on a custom user interface on top of Android 4.1, Nokia X acts as a feeder series to the Finnish company’s flagship products – the Windows Phone-based Nokia Lumia series. In terms of specifications, the Nokia X runs on a 1GHz Qualcomm Snapdragon S4 dual-core processor alongside 512MB of RAM and 4GB worth of internal storage. It also supports MicroSD card with capacity of up to 32GB and features a 3-megapixels fixed focus camera on its rear. The power for Nokia X is provided by a removable 1500mAh battery. Even though Storekini.com will be taking orders for Nokia X real soon, we don’t have any details that we are able to announce at this moment. Rest assured, you don’t have to wait long though since it is only one more day left before the launch event. For the mean time, check out our initial hands-on experience with the new Nokia X during our time at MWC 2014 right over here.